Although many people deny it, people live according to their worldviews. In the issues of the age of the Earth, origin and development of life, cosmic evolution, ice ages, and other historical science matters, we have seen time and again that preconceptions influence the interpretation of data. "Science" is not a monolith of absolute truth remaining uncompromised by the assertions of dispassionate scientists. 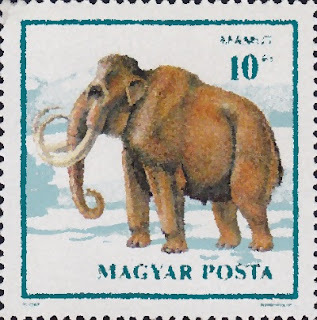 Hungarian 1990 mastodon stamp scan from my collection, modified with the oil painting tool. The Ice Age raises many questions, Manfred. Did it happen? How did it happen? How many were there? How long did it last? When it comes to the Ice Age, secular scientists are unable to saddle the data with their conjectures and models, especially the idea of multiple ice ages over long periods of time. Then they'll challenge biblical creationists to explain the Ice Age. Since scientists interpret data according to their worldviews, creationists find that recent creation, the global Genesis Flood, and other factors show that the biblical creationist view explains data far better than secularist views. Secular scientists have challenged creation scientists to explain the Ice Age. Also, they claim that there were numerous ice ages, possibly up to fifty, at intervals of 100,000 or 40,000 years over the past 2.6 million years. Bible believers need to respond to this challenge by appealing to 1 Thessalonians 5:21: “Examine everything carefully; hold fast that which is good” (NASB). As we maintain confidence in God’s word we need to carefully examine the observed data and be wary of how naturalism (‘there is no God’) has influenced its interpretations. To chill out and read the rest, click on "What caused the Ice Age?"